TOMS RIVER, N.J., April 12 (SEND2PRESS NEWSWIRE) — Counsellors Title Agency, Inc. announces that Carmine P. Giordano, a licensed title producer with 40 years of title experience, is joining its Toms River, New Jersey headquarters. Carmine P. Giordano began in the Title Insurance business as early as the mid 1960s, where he started as a Title Searcher in Essex County ultimately becoming a top policy producer. He is also the former President of the Monmouth County Title Abstractors Association. He is a graduate of Monmouth College and has a BS Degree in Business Administration. Counsellors Title Agency, founded in 1996, is one of New Jersey’s most respected title agencies, serving all 21 New Jersey counties with title insurance, clearing title, escrow, tidelands searches, and closing and settlement services for commercial or industrial properties, waterfront properties and marinas, condominiums, townhouses or residential single family homes. Counsellors Title also features its own Attorney Settlement Assistance Program™ (ASAP), which is an individual resource customized to fit the needs specifically of real estate attorneys, including: Documentation, Preparation, Disbursement of Funds, Attendance at Closing, HUD Preparation or Post-Closing Matters. CTA maintains an impeccable customer relations standard over the last 14 years which hundreds of attorneys, loan officers and REALTORS®, have come to rely on. 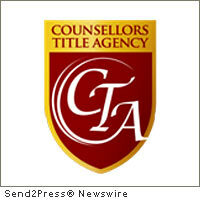 CTA’s Professional Specialties: Title insurance, closings, residential, commercial and governmental. For further information contact Ralph Aponte, President, Counsellors Title at 732.914.1400, or go to www.counsellorstitle.com . News issued by: Counsellors Title Agency, Inc. Original Keywords: title insurance, New Jersey, real estate, settlement services, Carmine P Giordano, Ralph Aponte, insurance, clearing title, escrow, tidelands searches, and closing and settlement services for commercial or industrial properties, CTA, ASAP, Attorney Settlement Assistance Program Counsellors Title Agency, Inc. Toms River New Jersey TOMS RIVER, N.J.
Alternate Headline: Carmine P. Giordano joins Counsellors Title Agency, Inc.
News Source: Counsellors Title Agency, Inc.
More from Counsellors Title Agency, Inc.
RSS News Feed for Counsellors Title Agency, Inc.
REFERENCES: Banking News, title insurance, New Jersey, real estate, settlement services, Carmine P Giordano, Ralph Aponte, insurance, clearing title, escrow, tidelands searches, and closing and settlement services for commercial or industrial properties, CTA, ASAP, Attorney Settlement Assistance Program Counsellors Title Agency, Inc. Toms River New Jersey TOMS RIVER, N.J.